ASLMA-156 | Size: 50 ml / 1.69 fl.oz. Natural Oils and Fats (soy, squalane, olives, calendula, shea butter, wax) – Comfort and firm skin, compensating for the deficit of lipids of dry or prone to drying complexions. Sepitonic™ M4 - An ideal active ingredient for mature complexions which acts as a restructuring and chrono-energizing, multi-mineral cocktail. Energizes skin, improves the epidermal differentiation for denser, more resistant skin. 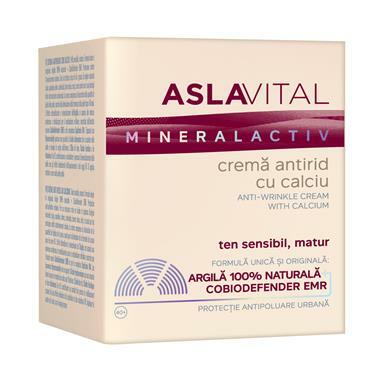 Vitamins A&E - Fight cutaneous aging, remove formed free radicals, offering protection against environmental damage. Rice Bran Oil - Reverses the effect of aging by slowing the formation of facial wrinkles. Usage: Apply in the morning and evening on a cleansed and make-up free face, neck and décolletage. INGREDIENTS: AQUA, GLYCERIN, GLYCINE SOJA OIL, GLYCERYL STEARATE, SQUALANE, CETEARYL ALCOHOL, OLEA EUROPAEA OIL, ETHOXYDIGLYCOL, DIPALMITOYL HYDROXYPROLINE, BUTYROSPERMUM PARKII BUTTER, TOCOPHERYL ACETATE, PHENOXYETHANOL, HYDROXYETHYL ACRYLATE / SODIUM ACRYLOYLDIMETHYL TAURATE COPOLYMER, DIMETHICONE, CETEARETH-22, OLUS OIL, CERA ALBA, MAGNESIUM ALUMINUM SILICATE, PERFUM, TETRASODIUM EDTA, RETINYL PALMITATE, DIMETHICONE CROSSPOLYMER, FERULIC ACID, HELIANTHUS ANNUUS (SUNFLOWER) SEED OIL, ETHYLHEXYLGLYCERIN, PEG-40 HYDROGENATED CASTOR OIL, SORBITAN ISOSTEARATE, POLYSORBATE 60, GLUCOSYL CERAMIDE, PENTYLENE GLYCOL, MAGNESIUM ASPARTATE, ZINC GLUCONATE, ORYZA SATIVA BRAN OIL, GLYCOGEN, SODIUM HYALURONATE, CALENDULA OFFICINALIS FLOWER EXTRACT, SODIUM HYDROXIDE, BHT, COPPER GLUCONATE, CALCIUM GLUCONATE, TOCOPHEROL.